I received a casting call as follows. I am a Casting Producer at a major production company, and we are currently looking to find people who have left the hustle and bustle of a large city behind for more a more relaxed lifestyle in the country. I was hoping that perhaps you would know any families who are currently in the middle of making that transition from the city to the country. We would be very interested in speaking with any families that could fit this bill. We know it's not always an easy move to make, and can come with many challenges, new discoveries, ups and downs etc. and we'd like to be able to follow all of those moments as they settle into their new home (can also be a vacation home). 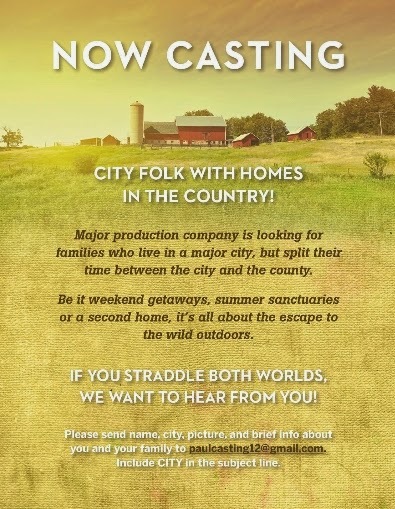 We heard from the network that they are now mainly interested in people who have a second home or vacation home in the country that they retreat to. They're looking for couples ages 20s - 40s with at least a couple kids still living at home. As far as the property goes, there are no restrictions for size, location, etc. We appreciate any referrals you can provide. Please feel free to email with any questions. What has happened in the past when people made themselves vulnerable to T.V. producers? "We heard from the network that they are now mainly interested in people who have a second home or vacation home in the country that they retreat to. They're looking for couples ages 20s - 40s with at least a couple kids still living at home. As far as the property goes, there are no restrictions for size, location, etc." Yeah, right. I know a LOT of young families in that age group who can afford to own and maintain two homes. And this network broadcasts from which planet, again? Haha A.McSp, this describes us except for the "ages 20s - 40s". I remember those ages though! Bet if I was in my 20s my back wouldn't be hurting so much right now!!! what i thought was funny is the assumption that relaxing would take place in the country. Didn't some production company conct you for somethng similar a year or so ago? If I recall correctly, all they wanted to do was have a show where they could ridicule the rubes and hayseeds. In the immortal words of the sage King Arthur in the old Monty Python movie, "Run Away!! Run Away!!" And from my youth, "I wouldn't touch that with a 10 foot pole!"